My big sister, Molly Smith Weber, has degrees from Yale and Stanford and was a vice president with Houghton Mifflin Co. and an extraordinary athlete. But in 1995, at age 37, she no longer knew the difference between a hairbrush and a hammer. As I watched her then stare at those items on a table in front of us, she was almost unrecognizable to me. A queasy feeling swelled in my stomach as I dared to ask myself for the first time if I was right to have wanted so badly for her to live. Molly’s severe brain injury was a result of 36 hours of carbon monoxide poisoning. Her husband, Walt, lying next to her in the hotel bed, had died. Molly had a baseline pulse, but was declared clinically dead. After being helivaced to a hospital, she received, almost by chance, numerous hyperbaric oxygen treatments. After nine days in a coma, Molly had difficulty identifying objects and didn’t know her right hand from her left, but she could read and type. It took a team of experts and weeks of therapy before she learned to swallow and walk again. And yet, she would crack jokes and could recall every lyric to any Elton John song. She knew every family member, but didn’t know where she lived or what this place called ICU was, or where Walt was, no matter how many times we told her. A Normal Life is the story of my sister’s brain injury and its impact on our relationship and on my family. How Molly and Walt went on a weekend ski vacation and when she stood up two weeks later, her world, and mine, and my family’s, were forever changed. About a month into our odyssey with Molly, a social worker told us that when one member of the family gets a brain injury, the entire family gets a brain injury. At the time, we didn’t know what he meant. We soon learned. I write about this gritty truth and the ways my thinking, planning, and judgment fell out of whack just when I needed them most. And how tricky it was for me to realize that my difficulties were both connected to my own piece of our family’s “collective brain injury” and hard to comprehend because of it. 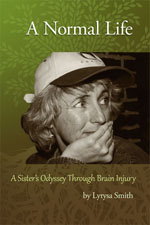 Brain injury changed everything for all of us. Through Molly’s story, I explore controversial medical science and topical, touchy issues: the experimental use of hyperbaric oxygen to heal Molly’s brain and the troubling decisions a family makes when a loved one is suspended in a place between life and death. This is also the story of my big sister’s mettle and determination. She had already conquered a physical disability as a child, overcome a major emotional setback as a teenager, and survived being raped in her 20s. Throughout the book, I use flashbacks to our youth and earlier times together before her brain injury to illustrate Molly’s personality and our relationship. The ripple effects of Molly’s brain injury were enormous and rattled through all of our lives. I expose how my friendships were thrown off-kilter, my partnership shattered, and my close-knit family turned inside out. Her injury still shapes our family today. My mother and I are my sister’s caregivers. She lives alone in her own home, but not independently. She requires daily care and oversight. Most of all, this book is about my relationship with my sister and the complex changes the whole family has faced with this most damaging and mysterious of injuries. Brain injury leaves in its wake an incomplete type of loss. Molly isn’t gone but she isn’t there either, and this changes the basic nature of my grief. This is not a story about recovery. Molly got better, then worse, and then, simply different. The old Molly is gone. A new Molly is here. I get to the heart of this life-wrenching dichotomy—to mourn the loss of my sister while simultaneously urging on, celebrating, and getting to know a totally new version of her. This story is laced with lingering loss, but it’s also long on humor and joy. Molly is a challenge, but she has a full, mostly happy life, and that’s pretty good. A Normal Life is a new take on the universal experience of loss and rebirth. It reveals the captivating tangle of how a brain is rejuvenated, rewired, and remapped; one life departed and also restarted. I take readers inside a recognizable story of family tragedy that brings turmoil and a new unity. But I also step through the unfamiliar territory of brain injury with its frightening array of unknowns. Through it all, Molly baffles, delights, and frustrates me, and continues to inspire me with her courage. If you would like to read the first chapter of A Normal Life for free, just provide your email in the sign-up box on the right. I’ll also send you updates and alerts about new blog posts and more. Thanks!